6,650 ± sq. ft. vacant lot that is paved and fenced along Lorraine Avenue. Zoned TF-3 and has several pieces of affixed electrical equipment on the lot. VACANT LAND Per the stated Terms of Sale, this property is sold AS IS WHERE IS WITH ALL FAULTS. 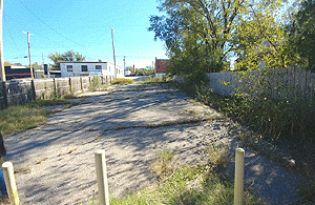 Vacant lot that is paved and fenced along Lorraine Avenue. The county lists the property as 6,650 ± sq. ft. (50’ x 133’) and there are several pieces of affixed electrical equipment in a corner of the lot. Site Area: 6,650 ± sq. ft.